Last week, Vox published an article titled “This simple calculator tells you how each presidential candidate’s tax plan affects you.” It couldn’t be more manipulative. Vox’s calculator, despite its catchy headline, does not show how your overall economic situation might change under each candidate’s policy agenda. What it presents is a number Vox calls “your tax liability,” which includes things you would never think of as part of your tax bill—like the payroll taxes your employer pays on your wage or the tax you pay on a bottle of wine. Using Vox’s approach, which draws on a narrow, but largely correct, analysis from the Tax Policy Center (TPC), simply getting a raise from your boss would look like a larger tax bill—bad news. As a result, Vox’s calculator overwhelmingly favors Trump and Cruz, while suggesting that Sanders’s plan would have a negative effect on disposable income for the majority of Americans. This is all a bit misleading. Final take-home pay—the amount of money you get to spend after the government takes its share and you have paid the cost of health insurance—has an exponentially larger effect on your life than your tax rate. Contrary to what is implied in Vox’s calculator, TPC finds that under the Sanders plan, middle-income the take-home pay of earners with employer-provided healthcare increases. Taxes, in other words, don’t exist in a vacuum—what the government does with those taxes matters quite a bit. A key part of the Sanders plan, for example, is health insurance. In Vox’s calculator, your tax rate increases to fund Sanders’s Medicare-for-All plan. But they’re not accounting for the fact that your employer will no longer be paying for your health insurance. Will you pay more taxes? Yes. But if your employer currently pays for your insurance, as is the case for about half of Americans, then companies’ newfound savings under Medicare-for-All will be passed onto you in the form of higher wages. The impact of this healthcare system would be huge. The Kaiser Family Foundation finds that the average employer-sponsored insurance costs $17,545 for a family plan, and $6,251 for single coverage. Under the Sanders plan, employers would pay an additional 6.2 percent in payroll taxes and individuals an additional 2.2 percent tax to finance health insurance. Many Americans come out ahead in the calculation once we include this important detail. 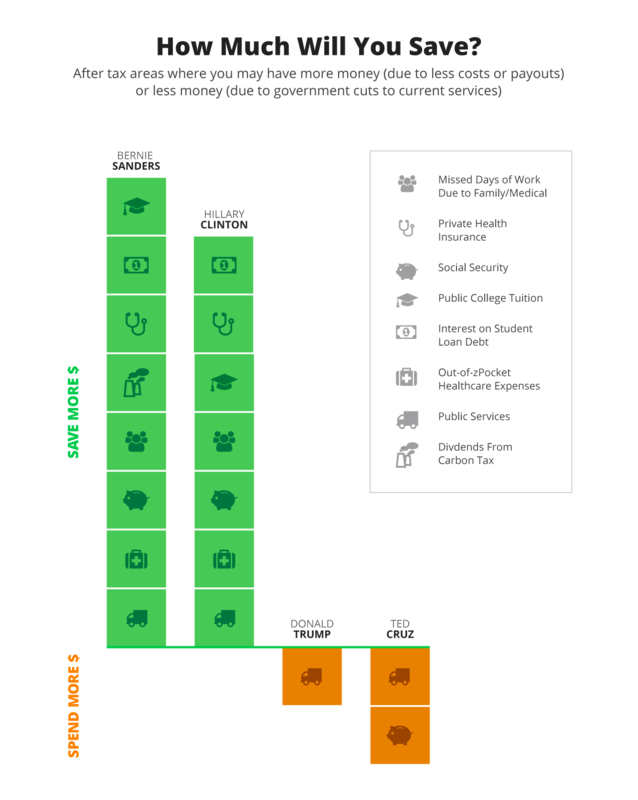 While Vox’s presentation is misleading, it’s certainly true that Sanders proposes tax increases, Clinton will keep things largely the same, and Trump and Cruz propose major tax cuts. But this doesn’t tell us anything useful about how much money we will actually have at the end of the day. We caught up with Roberton Williams, the economist at the Tax Policy Center responsible for the data, who explained that “what the government does with the money is not part of the model. The government can throw the money away, or spend it on healthcare and education…. The analysis would be very different if we were the tax and spending center.” Spending—or in other words tax dollars used to finance shared goods like healthcare, education, roads, Social Security, and so forth—is completely left out. What happens if you figure them in? According to Citizens for Tax Justice, under Sanders’s proposals, many Americans will not only see their take-home pay increase, they’ll also spend less of it on things like prescriptions and student loans. Under Clinton, things will stay largely the same. And under Trump and Cruz, you’ll have more money in your pocket on pay day, but you’ll have far more expenses. Cruz wants to gut five crucial government agencies, including the Department of Education. How much will you have to pay to send your kids to school under a Cruz administration? The massive cuts that the two Republican candidates propose ensure that you’ll pay a heavy price for lower taxes. Using Vox’s calculator, a proposal to completely defund public K-12 schooling and pass those educational expenses on to parents instead would simply show up as a reduction in a household’s effective tax rate. Let’s just scrap Social Security while we’re at it. Setting the calculation up to include taxing but not spending ensures a misleading picture of benevolent Republicans kicking cash to us all. We asked Dr. Williams if Vox’s calculator matched its headlining claim. He said, “To the extent that [the candidates’ tax plans] affects your overall economic well-being, it’s misleading…. we do not say how this will affect people’s overall financial situation.” If you care about the money in your pocket, then the Vox calculator is of little use. 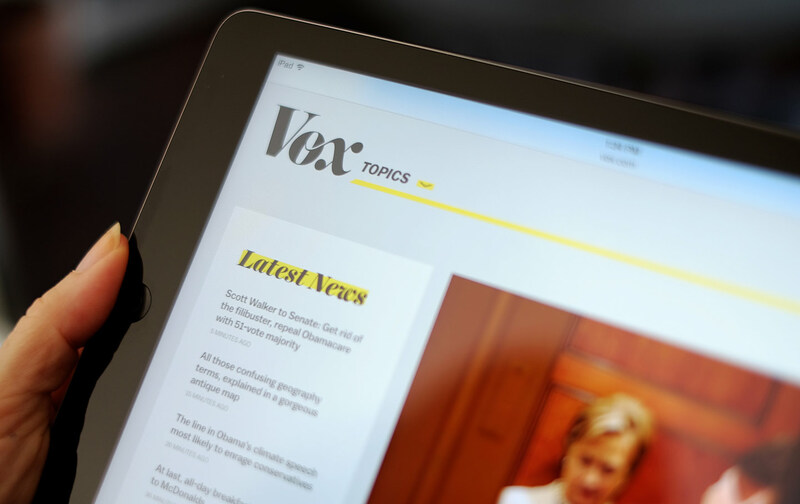 Should Vox wish to uphold its reputation for smart wonkery, they should scrap it entirely. This calculator is an estimation of your after-tax take-home pay. As you know, taxes are endlessly complex, so many simplifications were made. This calculator does a good job of explaining wage income, but it is not optimized for higher-income individuals with large amounts of unearned income. Of course! Come into the weeds with us. The calculator shows after-tax take-home pay. In order to get this calculation, we took the current tax code and added in proposed tax policies from Clinton, Cruz, Sanders, and Trump. The estimations are based on the 1040 tax form, thus they cannot generate accurate estimates for high-income earners with large deductions and itemizations, nor large unearned income (e.g., the Buffet rule). The calculator does handle high wage–earner policy in general, but if you have large itemized deductions or unearned income, please note that the tool is not optimized for your tax situation. We start with current tax policy, and alter it for each candidate. Replaced the current tax brackets with his proposed 10, 20, and 25 percent brackets. What proposed tax changes are not included? Please note, this tool is looking at a 1040 tax form, thus some proposed tax changes are not included in our calculations. We are also not including parents’ tax credits for children in college or for daycare expenses. Please note, our calculator is in 2015 US dollars. The Vox tool is in 2017 dollars. The calculator is not optimized for individuals over 65 receiving Medicare. 3. Why does my take-home pay go up? In some instances, you may see your take-home pay go up under some candidates. This can be for a number of reasons. Under the Republicans, your take-home pay may go up because your tax rate, the amount of money you pay the government, goes down. Under Senator Sanders, your take-home pay may go up, even though you’re paying more taxes. This may seem counterintuitive, but let us explain. We will assume, as the Tax Policy Center (TPC) does, that your total compensation, the complete amount you cost your employer, stays the same under the different candidates. Healthcare is a major expense for most employers. On average, if you have a family plan, the total cost is $17,545. Part of this, $12,590, is paid by your employer, while the remaining $4,955 is paid out of your pocket. Under the Sanders plan, your employer no longer purchases your health insurance, which is paid for through a tax. Thus, we assume (as TPC does) that your employer passes on the money they would have paid for health insurance to you, the worker, in the form of wages (after taxes, of course). Thus your tax rate goes up, but your pay may go up too. We do not account for the employee contribution to the health-insurance premium. Currently, the average family contributes $4,955 for a family plan. Under the Sanders plan, that would be money you no longer need to spend. That’s more money in your pocket. *While these are not policy, it is assumed by TPC, and us, that these become unnecessary and are thereby eliminated due to lack of use. This implicitly assumes that Sanders’s Medicare-for-All is passed. Mark PaulTwitterMark Paul is a Research Affiliate at the Samuel DuBois Cook Center on Social Equity, Duke University. He also teaches economics at the University of Massachusetts Amherst. David RosnickTwitterDavid Rosnick is an Economist at the Center for Economic and Policy Research. Emily StephensTwitterEmily Stephens is CEO of Gravity Switch and an independent researcher. She studied economics and international women’s health at the University of Massachusetts Amherst.